Reactive or Neoplastic Metaplastic Lesion? A 58 year old woman underwent an ultrasound guided mammotome biopsy for a subareolar mass. Image 1. 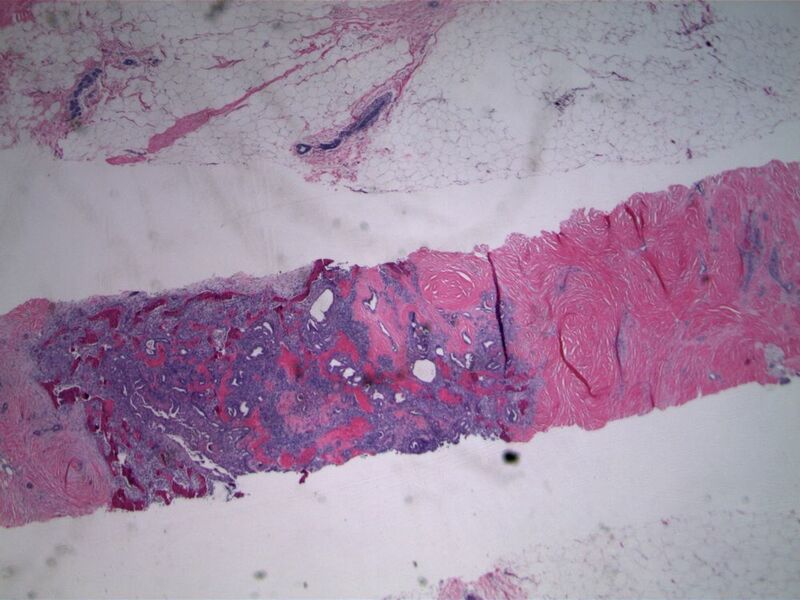 Exuberant epithelial proliferation is associated with dense sclerosis (right) and ossification (left). Image 3. Nuclear overlap and variability define the process as florid hyperplasia without atypia. Rare sclerotic fibrovascular cores are evident, supporting origin within an intraductal papilloma. Reactive osseous metaplasia is also present. Image 7. Spindled cells infiltrating fat express nuclear p63. Image 2. The epithelial proliferation is arranged in a streaming or swirling pattern, with irregular secondary spaces. Discussion: Low grade adenosquamous carcinoma is a special type metaplastic carcinoma with an excellent prognosis, (capacity for local recurrence only) despite the almost universal ‘triple negative’ immunophenotye. These low grade carcinomas are composed of varying proportions of glandular elements (often showing squamoid differentiation) along with a malignant spindled cell component. Sclerosing lesions, especially sclerosed intraductal papillomas are a favored setting for the development of these carcinomas. In this case, florid hyperplasia was associated with reactive osseous metaplasia, the latter feature should not be interpreted as osteosarcomatous differentiation. So the answer to the question posed in the title of this case, reactive or neoplastic is.....YES.